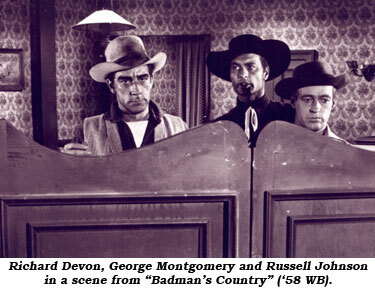 Badman Richard Devon’s deadly, thin-lipped evil smile became a TV western staple at Four Star during the late ‘50s and early ‘60s. 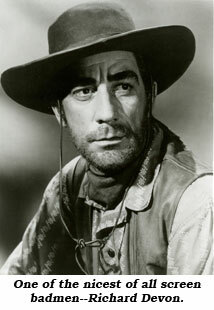 Four Star used Devon relentlessly on all their series, “Law of the Plainsman”, “Zane Grey Theatre’, “Johnny Ringo”, “Big Valley”, “Rifleman”, “Trackdown”, “Wanted Dead Or Alive”, “Stagecoach West” and others. 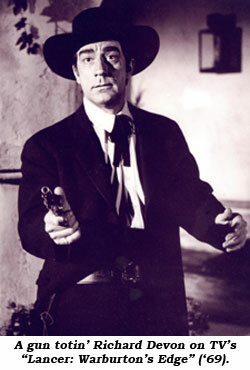 If Devon wasn’t to be found rustling cattle at Four Star, he was robbing stages on the Universal or Warner Bros. backlot. Born December 11, 1931, in Glendale, CA, Devon wanted to be an actor from the time he played a small part in a first grade grammar school production. Among all the odd jobs Devon did as a youngster was a part time job at a riding academy at the Griffith Park stable. He learned to ride so well they made him an alternate instructor on weekends. Graduating high school, Devon worked as a mail boy at Monogram, as a nurseryman, a mechanic’s helper and at the Hollywood Palladium as a bouncer. Answering a newspaper ad which offered training to the novice, Stage 8 drama school allowed Devon to work his way through as he didn’t have tuition money. During this time he made his first live TV appearance for experimental W6XAO atop Mt. Lee in the Hollywood Hills. Additional work came from Armed Forces radio, the Video Players little theatre and KTLA-TV. After studying with Richard Boone’s acting class for about six months, Devon began to find employment on live TV shows such as “Space Patrol”, “Marshal of Gunsight Pass”, “Tim McCoy Show” and “Matinee Theatre”. It was this training that brought him into better quality TV shows and films by 1955. 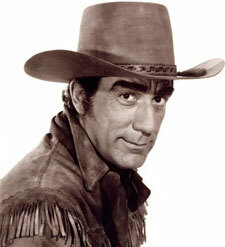 He also did radio, including a short stint as Batman on the “Superman” radio series. In between all this, he worked on stage, including “Country Girl” in Tustin, California. For 30 years the ominous, imposing Devon worked steadily. Then in 1985 he moved from Los Angeles to Mill Valley in northern California where he continued to do a lot of voice work, including commercials, a spoken word religious album in which he played Jesus, and work on George Lucas’ animated “The Ewoks”. 1991 saw him in his last film, an episode of “Midnight Caller”. When Richard’s wife Pat retired from United Airlines they made ample opportunities to travel. After thoroughly enjoying attendance at several western film festivals, Devon died of vascular disease February 26, 2010, in Mill Valley, CA.